Oil and Honey is McKibben’s account of these two necessary and mutually reinforcing sides of the global climate fight—from the center of the maelstrom and from the growing hive of small-scale local answers. With empathy and passion he makes the case for a renewed commitment on both levels, telling the story of raising one year’s honey crop and building a social movement that’s still cresting. "In this elegant and deeply inspiring book, Bill McKibben has given us something remarkable: a front row seat in the global battle against the fossil companies that are wrecking the planet, and an intimate glimpse into the intensely local life and landscape for which McKibben himself is fighting. This is the balance--between big and small, between rage and love, between resistance and alternatives--that we all must find if we are to transform in time to prevent catastrophe. A gift." "Whatever color you are, the green movement is your movement. I was proud to go to jail with Bill McKibben as a fellow protester against the Keystone XL pipeline. All you have to do is read this book." "Oil and Honey reads like a tell-all from one of America’s most astute eco-political leaders and essential writers. There are organizational secrets on how to launch a political campaign and build a movement, and why spreading local honey on morning toast matters. It is a personal field guide to climate activism with an honest accounting of the personal costs and blessings of engagement. 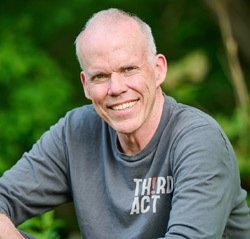 Bill McKibben has penned an inspiring story whose ending is still unfolding." "McKibben has proven to be one of the most accessible voices in the fight for a more sustainable planet. In Oil and Honey, the author extends his approach and message by meshing the global with the personal.... Throughout the book, his most readable yet, McKibben is simultaneously authoritative and conversational." "Bill McKibben these days is something of a rock star." "Confiding and dramatic . . . 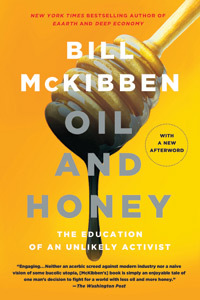 In this moving, wryly amusing account set against the heated presidential debate of 2012, McKibben describes his extraordinary world travels and what it took to launch gutsy, creative, and effective protests, and shares invaluable information and such intriguing insights as what bees can teach us about reaching consensus. Galvanizing and inspiring." "Tracking the emotional and intellectual journey that took McKibben from Vermont to picket lines in Washington, D.C. to town halls, universities, and arenas, the book is a call to action and an inspiring playbook for making change—both locally and globally—in the 21st century." "From the founder of the environmental organization 350.org, a chatty, warm memoir of his double life as globe-trotting activist and part-time novice beekeeper… A personal, enjoyably rancor-free account, filled with praise for his colleagues and some pokes at opponents but void of harangues." Bill McKibben interviewed on Democracy Now!